After many requests via my busy social media channels, I have decided to open up an Etsy shop where you can order some of my designs in form of Greetings Cards, Stickers, Pin Badges, etc. I will continually add to my Etsy page, so please add my shop to your favourites. 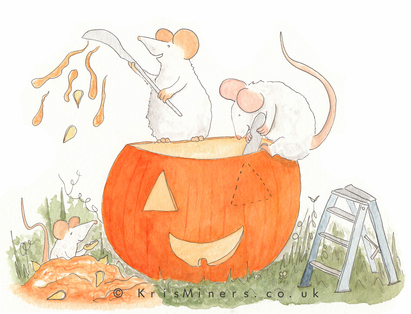 So, if you collect Halloween goods, unique whimsical art (prints and originals) or just want to purchase something a little more 'bespoke' then please feel free to have a browse. Thank you. I offer wholesale prices on the majority of my products, so if you run a shop or website and would like to stock my work, then please feel free to contact me via the contact section of the website and I will be happy to provide my latest wholesale price list to you. I use a fulfilment company to process orders to all parts of the world, and I cater for low volume orders for start-up companies right through to large volume. Should you require any work on a licence, then this is also a service that I offer.